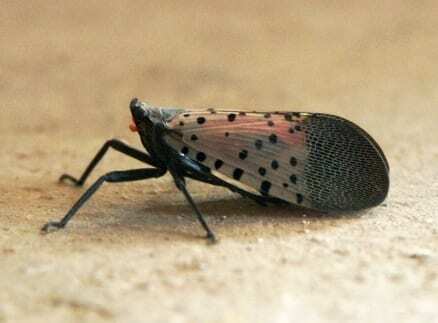 The spotted lanternfly is a non-native sap-feeding planthopper also known as the lanternmoth. The first sighting of the spotted lanternfly in the United States was in Berks County, Pennsylvania in 2014. In 2017 a single individual was found in Delaware in November and a few days later in New York. January 2018, adult lanternflies and their egg masses were found in Frederick County, Virginia. Thought to be native to China, the species spread to other Asian countries in the early 2000s. In South Korea, the population of spotted lanternfly expanded and caused significant economic damage to grapevines and fruit trees. Reporting has identified spotted lanternfly feeding on over 70 species of plants, including tree of heaven (Ailanthus altissima) – the preferred host plant; apple (Malus spp. ); plum, cherry, peach, apricot (Prunus spp. ); grape (Vitis spp. ); and pine (Pinus spp.) among others. Spotted lanternfly overwinter as egg masses containing 30-50 individual eggs and produce one generation each year. In Pennsylvania, nymphs hatch from late April into May and are less than ¼ inch long. Nymphs undergo four instars, all of which are wingless and incapable of flight. The first three instars are black with white spots and somewhat resemble ticks. The fourth instar develops red patches on the body and is over ½ inch long. Adult spotted lanternfly appear in mid-July in Pennsylvania and visually striking, especially when they are startled and expose the bright red coloration on hind wings. The forewing is gray with black spots near the base, and the tips are black with a dense series of lighter gray crossveins. Spotted lanternfly holds its wings over the body “tent-like.” The adult’s abdomen is yellow with black bands down the running down the center. Although they have wings, adults are weak fliers. Instead they jump with the aid of their wings. From late September until early December, in Pennsylvania, adults disperse widely and congregate on host plants (most commonly tree of heaven). This is a good time to search for spotted lanternfly. 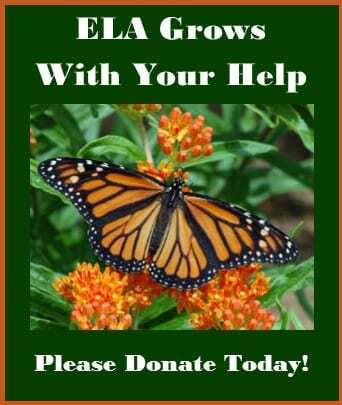 Adults lay brown to tan seed-like eggs in rows on host plants (most commonly tree of heaven) and other smooth surfaces (bricks, lawn furniture, etc.). Rows of eggs are often oriented vertically and covered with a gray, waxy secretion that first appears white, but quickly turns gray-brown in color. 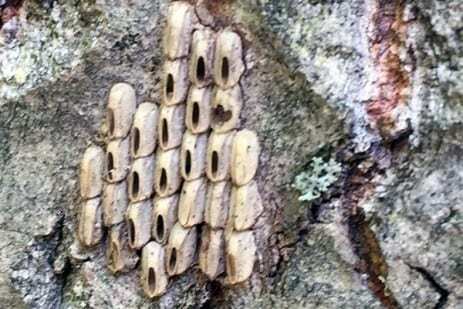 Trees fed on by spotted lanternfly will develop weeping wounds. The grey or black trails along the trunk produce sap that will attract other insects, particularly wasps and ants. There may also be a buildup of honeydew excrement on affected plants and on the soil around the plants. Black sooty mold may also grow on the honeydew or on the surrounding soil and understory plants. States already affected by spotted lanternfly, as well as states surrounding the affected region are on the lookout for new infestations. You can determine whether spotted lanternfly has been found in your area by referring to the US Department of Agriculture website. 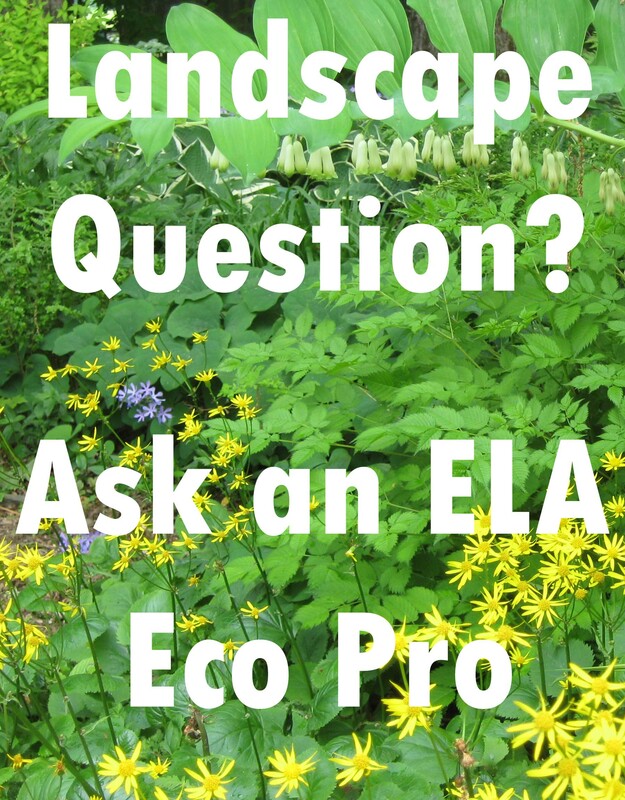 Pennsylvania – PennState Extension has a number of videos and print information. 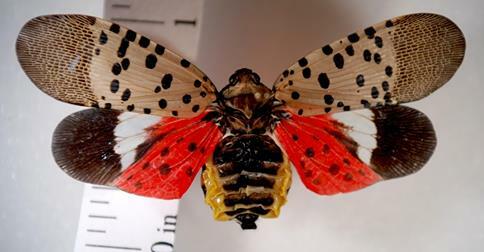 Go to https://extension.psu.edu/ and search on “spotted lanternfly.” The Pennsylvania Department of Agriculture also offers print resources. 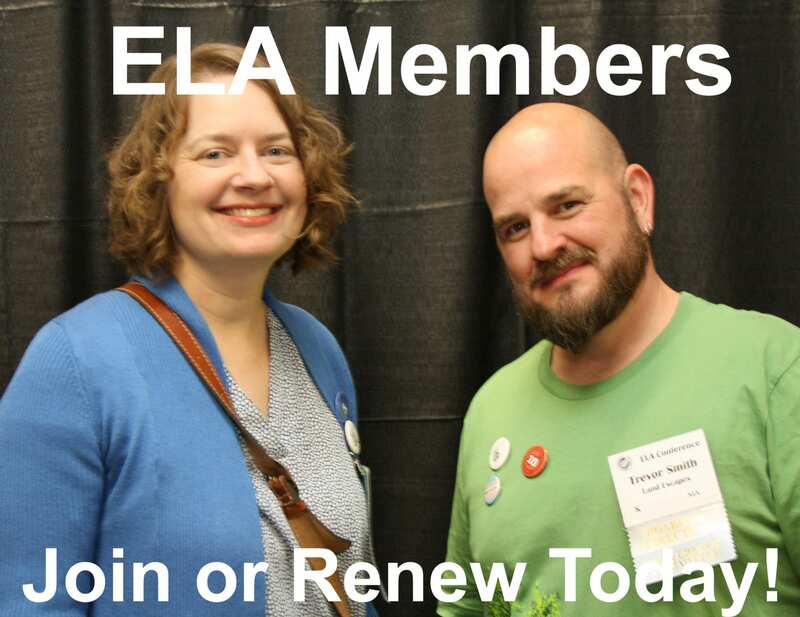 Maureen Sundberg has edited the ELA Newsletter since 2011, working out of her home in the Merrimack Valley of Massachusetts. 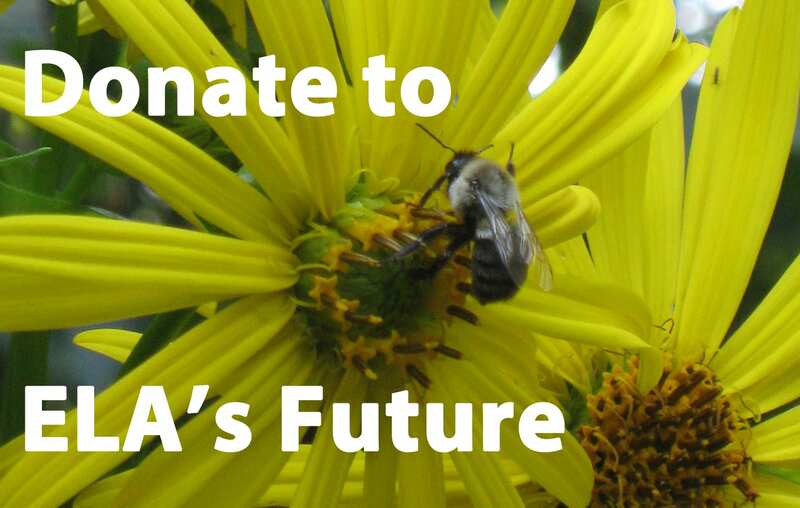 She spends spare time in her gardens developing wildlife habitat, incorporating native plants, and keeping an eye out for invasive pests. Contact her at ela_new @ verizon.net.